Follow the (mis)adventures of Charity Hope Valentine in this comedy-dance musical about love and hope. Nikki Gil plays the sweet but kooky Charity Valentine. Click for more. (SPOT.ph) Think Chicago, Burlesque, with perhaps a bit of Hairspray thrown in and you’ll kind of get an idea of what the Tony award-winning comedy-dance musical Sweet Charity is about. Based on the book by Neil Simon and adapted to the stage by the legendary Bob Fosse (also responsible for Chicago), Sweet Charity made its Broadway debut in 1966 and was later revived and revised in 2005 to cater to a more modern audience. Presented by 9 Works Theatrical, the local version stars Nikki Gil in the title role of Charity Hope Valentine, a blindly hopeful, in-love-with-love taxi dancer who remains optimistic despite the number of disappointments that have gone her way. After being dumped and robbed by her boyfriend, Charity meets Oscar (Kris Lawrence), a nervous, claustrophobic tax accountant. Could he be "the one"? Guided by her crazy friends, Nickie (Shiela Valderrama-Martinez), Helene (Ciara Sotto), and Carmen (Sheree Bautista), Charity discovers and loses love, deals with the challenges of being a dance hall hostess, and finds happily ever after -hopefully, anyway. 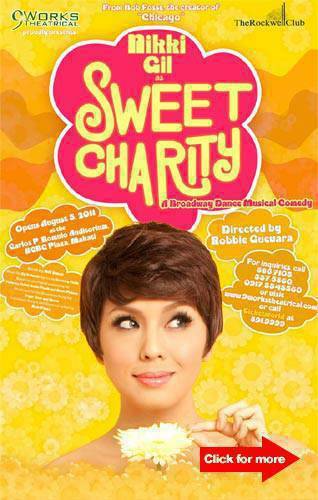 Directed by Robbie Guevarra and choreographed by Deana Aquino, Sweet Charity will run on Fridays (8 p.m.), Saturdays (3:30 p.m. and 8 p.m.), and Sundays (4 p.m.) from August 5 to 27 at the Carlos P. Romulo Auditorium, RCBC Plaza, Makati City.